Posted on July 6, 2012 at 11:18 am by Mary. It is not unusual for the kitchen table to become a catch all or a desk rather than a sacred place for meals. It is true that the open surface of the table lends to paperwork and creative projects that many times can’t be done anywhere else. While preparing a meal or mixing up cake it is nice to have the children close at hand working on their homework or projects. But to avoid this special space from losing its true significance try keeping a centerpiece on the table whether it be flowers, fruit or something else that uplifts the image of the table in the minds of the family. Some people keep attractive placemats or a tablecloth as a reminder that the primary use of the table is to gather and enjoy a meal together. These small touches actually will help the others to clear the table after their paperwork is done and leave it ready for its given purpose. 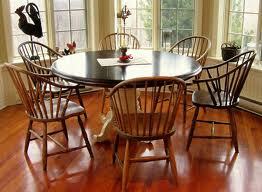 How you do keep the kitchen table clutter free and ready for meals? Share your ideas in the comments below. Next time look for some ideas on clutter control in bedrooms.